Do I Wait Patiently for God to Move? | GetAlongWithGod.comGetAlongWithGod | A blog about discovering a God worth knowing. Do I Wait Patiently for God to Move? Do I Wait Patiently on the Lord? Andrew Murray said, “In waiting on God, we discover how impatient we are and what our impatience means. We confess, at times, that we are impatient with men and circumstances that hinder us, or with ourselves and our slow progress in the Christian life. If we truly set ourselves to wait upon God, we will find that we are impatient with Him, because He does not at once, or as soon as we would wish, do our bidding” (Waiting on God). That’s it in a nutshell. When my ‘patiently waiting on the Lord’ becomes ‘WHERE ARE YOU ALREADY? !’ then I’ve exposed exactly where my heart is. 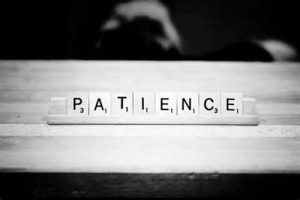 I’ve heard it said that patience is a virtue, but my experience has been that patience is entirely connected to a person’s heart condition. My ability to wait patiently for the move of God is sorely tested when those I love are in pain. A few days ago, a dear friend was hurt, and within hours I was beside myself with frustration at God. I had been praying yet my friend was still hurting; there was no marked improvement. My patience was gone, and I was almost angry with God over my friend. I realized that I felt betrayed by God’s lack of movement in healing them. I couldn’t wait patiently because God wasn’t doing my bidding, as Murray so succinctly put it. Perhaps the reason that the Holy Spirit brings me back to this scripture so often is because I lose sight of this truth so easily. In the case of my injured friend, I just wanted her to be healed…RIGHT THEN. And when she wasn’t, my heart was revealed. I was operating under the delusion that I knew better than God what was perfect for that situation. Murray was right; impatience occurs when I believe I know better than God, and He disagrees with me. I read that Andrew Murray’s father prayed for revival for 36 years before that prayer was answered. 36 years! Talk about waiting patiently for God to move. I was snarly within hours while Andrew Murray Sr. waited patiently for 36 years. I want that depth of faith and belief in the absolute goodness and sovereignty of God. But if we look forward to something we don’t yet have, we must wait patiently and confidently.